I hate it will buy again ! Safavieh's Courtyard Collection creates a dynamic presence with its fashionable and transitional designs that are suited for both indoor and outdoor settings. These rugs have been expertly power loomed of enhanced polypropylene to create intricate motifs and ensure a comfortable surface underfoot. For outdoor use, this rug will turn your deck, poolside, or patio into a resort-style entertaining space. Featuring a main accent color of natural, this rug is in vogue with its tasteful and bold modern design. This refined rug has clean lines and angles that make this rug a neutral option for integrating into existing decor. 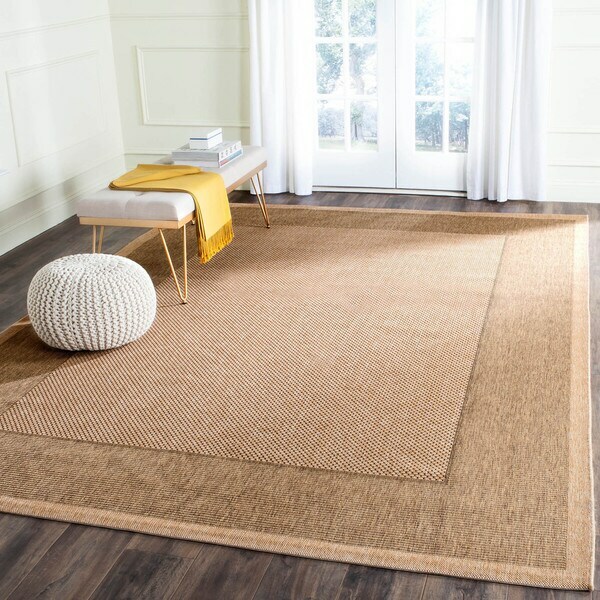 This rug makes an unassuming modern statement in any climate, whether under outdoor patio furniture, or in a kitchen, living room, or playroom. This rug is much more than I expected. I ordered the 6x6 square. Perfect for my 10 x 10 deck. Harder to find a true square in stead of a rectangle, love the color very natural and it blends into my outside decor. would recommend. This item is much too small for my bedroom.. I need it in a 6x9 and I am hoping that you will allow me to return the 5x7 and order a 6x9 instead.. Please let me know if this is possible as I would like to have this carpet as soon as possible.. 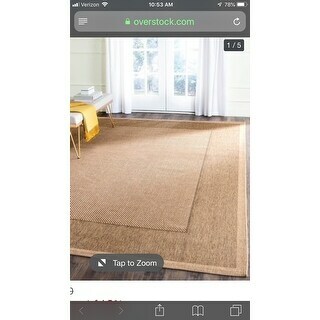 I thought I would have this rug at the front door for a high traffic area since it can be an indoor/outdoor rug. 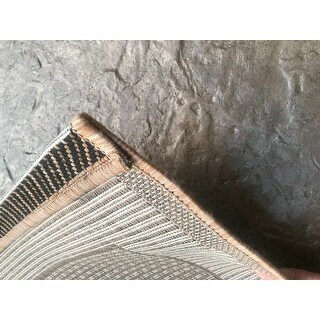 It is a nice rug, and seems durable but the whole rug is curl and won't lay flat, especially on the edge. Trying to find a new place in a house to put it on and considering to return it. This is the perfect rug for our family room. We have two dogs and a cat that come in and out of the patio door in that room and this rug does not show paw prints and dirt. It should be easy to clean. I did add the recommended under pad which makes it feel more substantial and suitable for indoor use. It is like a sisal material so it is not soft - but I like the texture.There are creases in the rug but they are slowly coming out. It is exactly what I was looking for - attractive and durable. I am very pleased with this purchase. I am very happy with this Rug.I bought 2 of these for my 2 level Deck.Excellant Quality! Great Value for the Cost.I bought both on Sale.They look so nice on my Deck,and the Color is perfect! Nice Neutral Color that goes with any Decor.The Black threads actually look better in person then it did on-line! Very Happy with my Purchase! 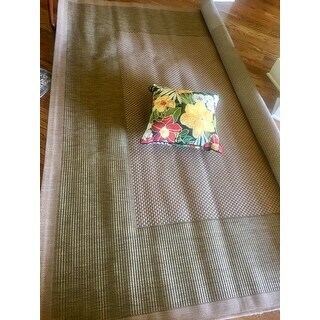 Purchased two 8x11 rugs for my enclosed porch. They look and feel great. I thought they would be a little more scratchy, but they are actually quite comfortable under bare feet. I love the color as well. This rug is great! 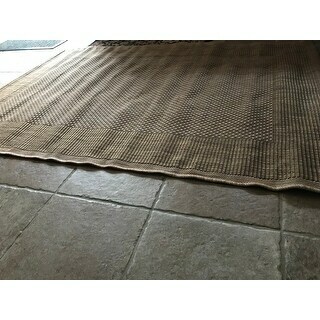 Its an indoor/outdoor rug i put in living room at our ranch where there is a lot of traffic and dogs . it cleans easy which is even better! Have received more compliments on this rug in the 2 weeks I've had than I did on the rug I replaced it with in the 2 years I had it. The quality is much better. I'm very happy with my purchase (as always)! Placed rug outside on deck in April. The rubber is popping out and needs to be replaced and its only November of the same year!!! The color is good, the size is perfect, the price okay. The rug is not soft, which is what I wanted. I can use it but softer would have been nice. excellent, look great in my dinning room. I normally don't write a comment but I am so excited about this rug!! Having 3 dogs I was looking for a rug that is durable and can be easily taken outside and hose down if needed. No more pulls from their toys or nails. I liked it so much that I purchased a second one. We are slightly disappointed that the color of the actual product is much lighter than shown on photo. It's more like a light tan instead of the reddish brick /rusty appearance shown here. Overall, it fits the double entrance front door and will serve the purpose of purchase. I love this rug. Does not shed. Nice natural colors. Blends well in my sunroom. It lays flat and the big plus is the natural colors and black specs in the center. Hides dirt well. I would definately buy again. Update: After having it for over a month, I will have to throw it away. The edges on the long side curl up so much it’s a tripping hazard. I even tried wetting it and drying it with a chair to hold down the edges. it still curls up. When the rug arrived, the edges were lumpy. After a few days in the sun, it straightened out. The strange part about the rug is that the ends of the rug on the narrower sides have the the border permanently tucked under. Wish I could be clearer - the normal ends of the rug on two sides are tucked under the rug and glued. Hopefully, the pictures help. I wish it was not tucked under as it causes lumps at both ends, it can be seen from the side and the border is only on two sides. It’s weird. Beautiful rug on my back porch. Very durable! Matches very well for what I wanted. I did read that the ends curl but bought took the chance...ends curled. I just turn the rug over for a few days and seems fine. Was nothing like the photo or description! Not even close to the color it showed . My 2 photos on the left and the overstock one on the right! Plus it won’t lay flat as the photo indicates so Came damaged! Beautiful rug that is perfect on our breezeway. Heavy enough not to blow up on the corners and lays nicely. I needed some rugs for my kitchen and being that these can be washed off with a hose, they are the perfect solution. The rugs are very nice and they even have a small black design that I wasn't expecting and this made the rugs even more perfect for my use. Great purchase and I would purchase again for outdoor use. "is it listed as fire retardant "
"Is this cat friendly? I like the look of jute but know my cats would have a field day." I purchased this rug earlier this year.. ...............and have been VERY HAPPY with it. It has a low pile, is synthetic materials and has a TIGHT weave. I also had cats as pets for years........from childhood. This rug, in my opinion, is an excellent choice and tolerates less than ideal circumstances, in and outdoors. Doesn't stain easily and as long as you have a scratching post, I think this is a low risk proposition for you......................not much of a "nub" to encourage catch claws.............Also believe this rug is jute free; added bonus, no shedding!!! (You can access the Description/Specification area to confirm.) GOOD LUCK! I have a cat and this is very durable and very cat friendly. I highly suggest. "I want to use these rugs outdoor in direct sunlight. Recommended or not? Will it Fade? 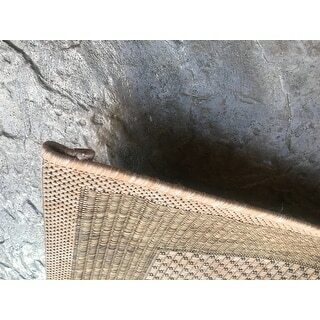 thanks"
I use this rug in a screened area which gets sun most of the day, and I haven't had any fading issues. It's a great rug! A nice price for the superior quality!! "How do clean this rug. Thank you!" Our outdoor rugs can be rinsed off with a garden hose. Please make sure to allow for drying on both sides of the rug to prevent any damage. "Just got my rugs. They are all wrinkled. How do I get the wrinkles out. It looks terrible. Cheap." My rugs also arrived somewhat wrinkled. They had been very tightly rolled up. I prefer simple, organic solutions. I laid them flat on the floor, without a pad, initially. .............weighted them with a few heavy furniture pieces............... and Voila, within a few days and no added expense, they laid flat and evenly. (I don't believe the results would have been nearly as fast or satisfactory if immediately placed on a pad.) .............. No reason to believe your results won't be equally positive#!# Give it a try. Nothing ventured, nothing gained..... Right? My large rug arrived tightly rolled and wrinkled in a few spots, but after being laid out for a day or so it was completely wrinkle-free. 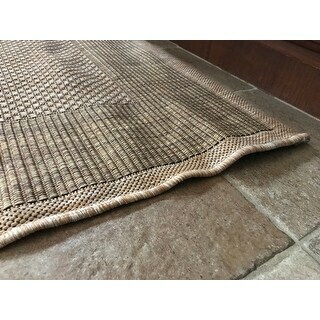 I have owned several of these indoor/outdoor rugs, and I find this one is particularly well made and superior in quality! "Do you have 9ft*12ft round "
Yes the 9 X 12 is available under the options tab. 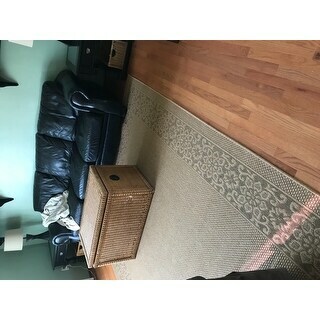 "I bought the 9x12 and 2x3, opened the small entrance rug and not happy with the edges looks wrinkled , hesitant to open the big rug because if it looks the same I will hate it . How do you get it to look like the ad ?" I have the 2x3 in a bathroom, and it eventually unwrinkled after almost a month - some partly from the foot traffic and some probably from the steam in the room. I manually tried to take out some of the wrinkled edges in the beginning and it didn't really work.